Planned Parenthood Abortionist on Hand Washing: Is That a New Standard? You are here: Home / Planned Parenthood / Planned Parenthood Abortionist on Hand Washing: Is That a New Standard? New Missouri law may help prevent Planned Parenthood from opening four more dangerous abortion facilities, and a new inspection report shows that would be a good thing. St. Louis, MO – The Missouri Senate took advantage of a special session to send a bold new bill, SB5, to pro-life Gov. Eric Greitens, that will ensure annual inspections of abortion facilities, and numerous other provisions designed to provide greater protections for women, more accountability for abortion businesses, and a better mechanism for enforcement of abortion laws. Gov. Greitens signed the measure into law Wednesday afternoon. Missouri has only one abortion facility, the Reproductive Health Services Planned Parenthood in St. Louis. However, Planned Parenthood has announced plans to open four new abortion facilities in that state. The new law will likely put a damper on those efforts. Now, a new inspection report just released to Operation Rescue by the Missouri Department of Health and Senior Services (DHSS) shows the dire need for this legislation. The inspection report reveals egregious deficiencies recorded at Reproductive Health Services Planned Parenthood in St. Louis, Missouri, during a failed health and safety inspection conducted on May 25, 2017. It also revealed an arrogance on the part of Planned Parenthood abortionists and staff that challenged a state health official on long-standing infection control standards and willfully ignored a law that requires abortion facilities to report abortion complications. Newman noted that there was also evidence that the Department of Health was turning a blind eye to complaints and giving Planned Parenthood a pass on serious deficiencies that affect patient health. Reproductive Health Services Planned Parenthood was cited during the May 25 inspection for failure to report abortion complications within 45 days to the Department of Health and Senior Services as required by Missouri law. The inspector reviewed the facility’s complication log and noted that several women sought post-abortion care for reportable complications such as hemorrhage, infection, uterine perforation, cervical lacerations, and retained aborted baby remains. Planned Parenthood never reported complications even though they were aware for months that the law existed. Planned Parenthood’s Director of Quality told the inspector the facility wanted a “clearer definition of complication” before they would comply with the law. The bill just approved by the legislature would give authority to the Attorney General’s office to bring suit against abortion facilities when local authorities fail to act. Hand washing: Is that a new standard? In another egregious violation that resulted in multiple recent citations, two abortionists and several staff members were observed by a state health inspector failing to wash their hands between glove changes. The inspection report indicated that glove usage was not a replacement for hand hygiene. After abortionists would perform such tasks as vaginal exams, cervical blocks, and laminaria removal, and never wash their hands between glove changes. Some staff members were seen handling their cell phones, rubbing their noses, putting gloved hands on hips or in pockets – all of which contaminate the gloves – then either did not change the gloves or failed to conduct proper hand hygiene between glove changes. 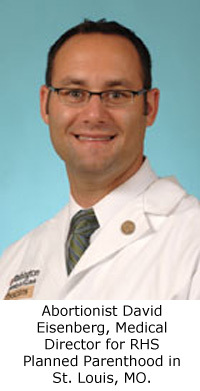 Almost remarkably, the Medical Director and abortionist David L. Eisenberg, “questioned if hand hygiene between glove changes was a new standard” and inquired whose standard it was. Properly washing hands between glove changes was noted to be a nationally recognize standard from the Centers for Disease Control. His response indicated that his unsanitary practice of not washing his hands was longstanding and could have affected the health of every women seen by Planned Parenthood. Reproductive Health Services Planned Parenthood was also cited for improperly removing dirty surgical instruments from procedure room partially wrapped in a disposable pad instead of transporting the soiled instruments in a covered, leak-proof container labeled with a bio-hazard label. It also violated other infection control protocols by failing to properly use germicidal wipes to clean up blood on abortion table, and failure to maintain a sanitary environment free from holes or rust that harbors diseases and transmits infections. In an example of how certain deficiencies were left uncorrected for years, the abortion facility was cited in May for tape residue on the oxygen tanks. Such residue harbors bacteria and cannot be sanitized. However, Planned Parenthood was also cited for tape residue on the oxygen tanks during a licensing survey on January 31, 2013. It appears the same tape residue was never cleaned despite multiple citations over a four-year period! There is evidence that the Missouri Department of Health and Senior Services was turning a blind eye to violations, and especially complaints filed against Planned Parenthood. All but two investigations determined that there were no deficiencies, or that the Planned Parenthood abortion facility was in “substantial compliance” – an oddity since most of the investigations were off-site and never involved a visit to the abortion facility. That one investigation where deficiencies were found was done in conjunction with a licensure survey on March 31, 2015, where 17 pages of violations – some repeat offences – were cited. “SB5 is a desperately needed law that will prevent Planned Parenthood from exploiting women by cutting corners on facility sanitation, concealing serious abortion complications, and other violations that endanger women’s health that Planned Parenthood has gotten away with for years,” said Newman. •	Prohibits seeking to harass and disrupt the work of pregnancy resource centers. •	Grants the Missouri Attorney General the authority to bring suit against an abortion facility for violation of abortion laws even when local prosecutor fails to act. The law is due to go into effect in late October. 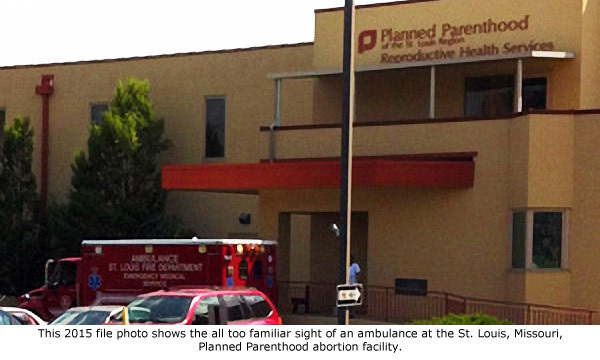 Read Operation Rescue’s Special Report detailing previous inspection reports from Planned Parenthood in St. Louis dating back to 2009 that prove this facility isn’t clean or safe.